My visit was great. Dr. Danastor is very educated and well spoken. She made me feel comfortable and was open insharing information and my visit... I recommend you if you are reading to visit.. ???? My visit was great. Dr. Danastor is very educated and well spoken. She made me feel comfortable and was open in sharing information and my visit... I recommend you if youare reading to visit.. ???? Staff is super fast and really friendly. Dr. Danastor is an amazing doctor. I have been looking for a doctor whoreally care... and she does! She explained everything and most of all she took the time to hear me. I really recommend her. Amaizin! Staff is super fast and really friendly. Dr. Danastor is an amazing doctor. I have been looking for a doctor who really care... and she does! She explained everything and mostof all she took the time to hear me. I really recommend her. Amaizin! Dr. Tahnie Danastor is a part of Kompal Gadh’s practice in Pembroke Pines and Weston, FL. She is a trusted obstetrician and gynecologist, eager to serve women at all the different stages of life. 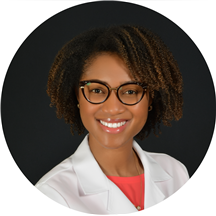 Dr. Danastor earned her medical degree from the University of Florida, Gainesville. She went on to complete her residency in obstetrics and gynecology at St. Vincent Hospital. She is fluent in English, French, Creole, and Creole (Haitian), which makes her skilled in building and strengthening relationships with diverse populations. She treats a range of concerns, such as ovarian cysts, endometriosis, fibroids, vaginal prolapse, and vaginal infections. Patients also visit her for consultations regarding birth control as well as in vitro fertilization (IVF). Dr. Danastor integrates her medical expertise with state of the art technology and strives to provide the highest quality of healthcare. She is a highly trained professional who puts patient care at the forefront. In her spare time, she likes to dance, read, and travel with her husband. The best doctor I’ve ever met! She was great. Answered my questions, very patient and wonderful. It was my first visit and she made me feel so comfortable. She put my mind at ease and answered all my questions. I absolutely love this office. I didn’t feel rushed with Dr.Danastor. I felt she took her time and had an excellent bedside manner. She was very nice to me and she knew what she was doing. It was my first time so she made me not scared to be there. She did a wonderful job and hopefully many more with me . I got there and had to sign a few papers and went right bank; no waiting. Everyone I met was super sweet. The phlebotomist was one poke and done. I'm extraordinarily hard to get blood from so that's saying something. Seriously,she got it on the first try. Dr. Danastor was the consummate professional with a kind, warm, and gentle bedside manner. I think she was just as excited to help me achieve my goals as I am. I love her so much and am very excited to continue the journey with her to achieve my dream! This visit couldn't have gone any better. Total win! I thank all of you fantastic women that made this a stress less visit. Dr. Danastor is not only knowledgeable, but also friendly and open. She makes annual appointments less daunting and helps you through them with a bright smile and a positive attitude. She’s such a sweet heart and is open to listening to your concerns. Doctor is super friendly, compassionate and professional. She explained in detail about he procedures and answered my questions very thoroughly. She made sure that I was feeling okay at all times. Also, she made great conversation that tookmy mind off of the discomfort of the procedure. Very understanding and patient. Only downside is the waiting time- it took more than 30 minutes from the scheduled time of appointment until she actually saw me (this has happened the 2 times I have been to her office) but she makes worth the waiting when she comes in and greets you with a huge smile. Thanks Dr Tahnie! For me she is the best Gynecologist very caring and helps you with everything that you are concern with I didn't have to wait long everything was really quick. She has such a great energy. Very attentive and informative and truly concerned. I felt more like a friend than a patient. Great experience. Dr Tahnie Danastor is so amazing. She was so welcoming and informative. Wow! I am so pleased I found her. Very professional, sweet and down to Earth. I love her . Great Doctor! She’s very thorough and has great bedside manners. The wait to see her was not bad at all!! The only downside is that the office made it so that we could fill out the information online through Zocdoc but when Iarrived they still had us fill out paperwork. I find it redundant. The front desk greater could be a little bit friendlier. But overall this was one the best experiences i have had in a long time with doctor’s offices in the south Florida area. I hope they keep it like this and don’t change. She’s just a amazing human being. Love love her! Dr. Danastor is knowledgeable and has great bedside manner. She made me comfortable at my visit. I would highly recommend her! She is fantastic! 10/10 will absolutely recommend. I was comfortable with her the moment we met! Fantastic! Dr. Danastor made the visit so comfortable and easy. Staff is great too! All people working there, are very attentive, specially Ilona. Dr. Dan Astor was such a gem from start to finish ! She made me very comfortable and answered all my questions promptly! I can’t wait for my next visit . She is so amazing and caring. Truly empathetic and extremely thorough! Makes me feel comfortable every time. So happy I started to see her! What a lovely, down to earth doctor with a sense of humour. I dreaded this visit but so happy I met somebody like this. I highly recommend her. I have been to many doctors and at last I found one willing to give me the attention to actually start treating my pain. She’s the best doctor I’ve ever had !! She is great. Explains everything and make you feel very comfortable. I love Dr.Thanie. She is very sweet and very professional. Dr. Dan Astor is very personable and friendly. She made me feel very comfortable and explained everything she was doing along the way. She feels like an old friend. I have definitely found my new GYN and will refer her in a second!! Dr. Tahnie Danastor was not present today but I was informed of her absence before confirming my appt. I agreed to see the nurse practitioner and the visit went very well. I was there for no more than 40 minutes includingfilling out paperwork being that I was a new patient. Dr. Danastor was very pleasant. She listened carefully to my concerns and approached each question professionally. She made sure to discuss everything with me thoroughly and inform on all risks involved. She provided a website that I can lookat to do some research myself if I still had concerns. Her bedside manner was incredible. I was in and out of the office in a timely fashion. I left there feeling like all my questions were answered and completely satisfied. It was the most attentive a doctor has ever been. Not trying to rush me out in five minutes like others I’ve encountered, and paying attention to every detail and concern. Dr. Danastor is simply amazing! She took her time with me and actually seemed interested in what I was sharing with her in regards to my experience. I am so glad that I’ve found her and recommend her to anyone looking for a compassionate and skilled OB/GYN. Dr. Tahnie was beyond amazing she took her time and listened to me and explained everything! I felt better after my visit. She was so nice, it was a very pleasant experience. It was my first time going to a gynecologist office and she made it very comfortable. I will definitely be going back and I would absolutely recommend her to anybody. I believe the doctor has a great bedside manner, compassionate, understanding, and very well educated. This experience was like no other. I’ve found a place to call home and that is with Dr. Danastor and her lovely staff. Dr. Danastor is the absolute best, she is super sweet and so thorough, she explained everything and asked really good questions to better understand my concerns. Her enthusiasm really proves that she loves what she does and wants to help. I would recommend 10/10!